If they’re right, it will change planning and investment decisions for wind power. A survey of experts in wind energy found they predict prices will fall faster than most published models expect, a new study found. The speed with which wind energy burst onto the international scene makes it hard to predict how the sector will grow in the decades to come. 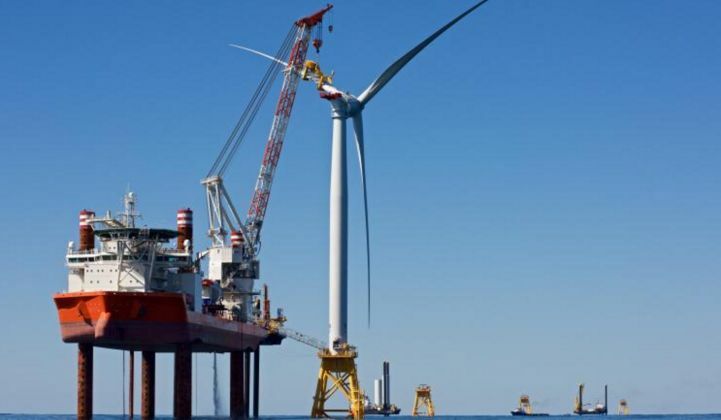 Offshore and floating offshore wind are particularly nascent. The academic literature on cost modeling relies heavily on past data to establish learning rates, which can then predict future cost declines as the industry expands. Since there is limited data to make these predictions for wind energy, the authors, from Lawrence Berkeley National Lab and the National Renewable Energy Lab, looked to a different methodology. The study performed what's known as an "expert elicitation," which basically means asking a bunch of pros what they think about the topic. In this case, the population sampled was 163 wind experts from around the world, which the authors bill as "the largest single expert elicitation ever performed on an energy technology." This type of study can't eliminate bias on the part of individual members, but it's a great way to establish credible estimates for trends that don't have a lot of data to parse. The pool of experts anticipates wind costs dropping faster than most of 26 recent published predictions from government, academic and industry sources. The literature review had a median prediction of 11 percent decline in levelized cost of energy by 2030 and 13 percent by 2050. 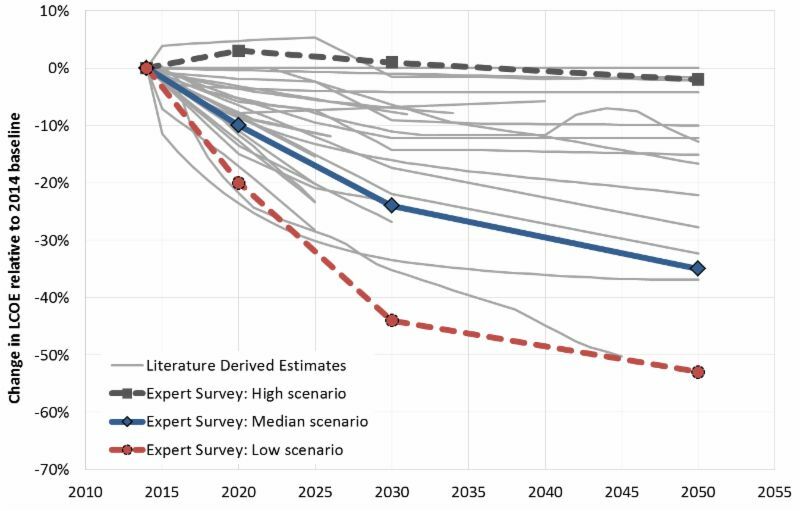 The stable of experts, though, anticipates a 24 percent drop by 2030 and 35 percent by 2050. LCOE measures the total cost of energy produced over the life of a project, so it's a more complete metric than just looking at upfront capital costs. Image credit: Wise et al. As explained in a blog post on the study by the Berkeley Lab, the survey respondents differ from the U.S. government's projections as well. The Energy Information Administration's outlook, for instance, has wind LCOE going up by 13 percent between 2018 and 2022, and then only dropping 16 percent by 2040. "The U.S. EPA, in their assessment of the Clean Power Plan, seemingly predicts virtually no change in wind costs from 2016 to 2050," the post continues. "And finally, even the U.S. DOE Wind Vision study's 'mid-point' estimates of 16 percent reductions by 2030 and 22 percent by 2050 are more conservative than the survey results." This is wonky stuff, but it feeds right into calculations of what kind of role wind will play in the global energy mix, and that role is highly uncertain. The Intergovernmental Panel on Climate Change analyzed 150 long-term energy scenarios and found the median climate mitigation scenario predicts wind producing 13 percent to 14 percent of the world's energy in 2050. That said, the range spans from below 5 percent up to 50 percent. If utilities, governments and industry plan for the future based on wind cost models that turn out to be overly conservative, they could lock in alternative investments, like gas generation plants, that turn out to be dirtier and more expensive than what wind projects could provide. Of course, there's a danger with overly optimistic predictions as well -- expecting more wind output than the markets can support won't help anyone. The good news is, with every new year of wind deployments, statisticians will have more numbers to crunch to produce a more reliable model of the future. Until then, the opinion of this collection of experts offers a glimpse of what the future could hold based on the best knowledge of the state of the industry today. And they think costs are quickly headed down and to the right.